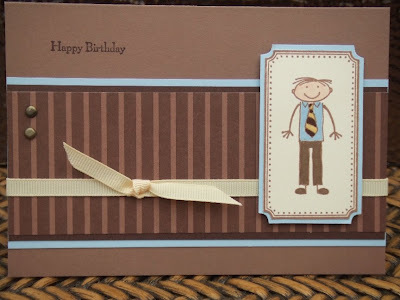 The Cupcake Craft Challenge set, was to produce a card for a man or a boy. Hi Teri, great card, I love your SU papers. Thanks for joining us at CCC. Super cute take on this weeks tough challenge. I love that image! Another gorgeous card - so cute with fab colours. I definately need to spend some time with you at a class - just hope a little part of your talent rubs off on me!! A lovely card,thanks for taking part in this weeks CCC! Great colour combo and your layout is beautiful too. Thanks for joining us this week at CCC! perfection. I love it! That stamp stamp-a-ma-jig is invaluable isn't it? The paper is perfect and the layout is terrific. what a fantastic masculine card. Oh I absolutely love this card so cute but yet so manly. Thanks for joining us at CCC this week. Fabulous card. Thanks for joining in at CCC this week.